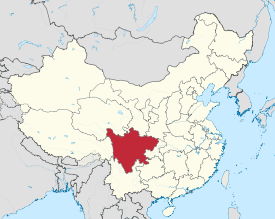 Sichuan ( 四川; formerly romanised as Szechuan or Szechwan), is a province in southwest China occupying most of the Sichuan Basin and the easternmost part of the Tibetan Plateau between the Jinsha River on the west, the Daba Mountains in the north, and the Yungui Plateau to the south. 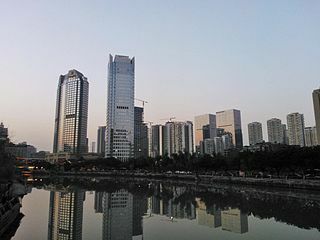 Sichuan's capital city is Chengdu. The population of Sichuan stands at 81 million. Many people believe that the name Sichuan means "four rivers", and in folk etymology this is usually taken to mean the province's four major rivers: the Jialing, Jinsha (or Wu), Min, and Tuo. According to historical geographer Tan Qixiang, "four rivers" is an erroneous interpretation of the place name. The name of the province is actually a contraction of the phrases Sì Chuānlù (四川路, "Four Plain Circuits") and Chuānxiá Sìlù (川峡四路, "Four Circuits of Chuanxia"),[note 1] referring to the division of the existing imperial administrative circuit in the area into four during the Northern Song dynasty. The character Chuan (川) here means "plain" and not "river" as commonly believed. In addition to its postal map and Wade-Giles forms, the name has also been irregularly romanized as Szű-chuan and Szechuan. In antiquity, the area of modern Sichuan including the now separated Chongqing Municipality was known to the Chinese as Ba-Shu, in reference to the ancient states of Ba and Shu that once occupied the Sichuan Basin. Shu continued to be used to refer to the Sichuan region all through its history right up to the present day; a number of states formed in the area used the same name, for example the Shu of the Three Kingdoms period, and Former Shu and Later Shu of the Ten Kingdoms period. Currently, both the characters for Shu and Chuan are commonly used as abbreviations for Sichuan. The Sichuan Basin and adjacent areas of the Yangtze watershed were a cradle of indigenous civilizations dating back to at least the 15th century BC, coinciding with the Shang in northern China. The region had its own distinct religious beliefs and worldview. 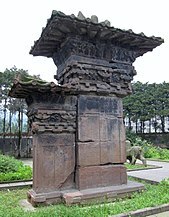 The earliest culture found in the region through archaeological investigation is the Baodun culture (c.2700–1750 BC) excavated in the Chengdu Plain. The most important native states were those of Ba and Shu. Ba stretched into Sichuan from the Han Valley in Shaanxi and Hubei down the Jialing River as far as its confluence with the Yangtze at Chongqing. Shu occupied the valley of the Min, including Chengdu and other areas of western Sichuan. The existence of the early state of Shu was poorly recorded in the main historical records of China. It was, however, referred to in the Book of Documents as an ally of the Zhou. Accounts of Shu exist mainly as a mixture of mythological stories and historical legends recorded in local annals such as the Chronicles of Huayang compiled in the Jin dynasty (265–420), and the Han dynasty compilation Shuwang benji (蜀王本紀). These contained folk stories such as that of Emperor Duyu (杜宇) who taught the people agriculture and transformed himself into a cuckoo after his death. 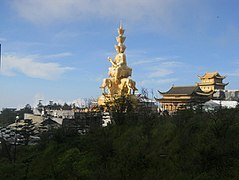 The existence of a highly developed civilization with an independent bronze industry in Sichuan eventually came to light with an archaeological discovery in 1986 at a small village named Sanxingdui in Guanghan, Sichuan. This site, believed to be an ancient city of Shu, was initially discovered by a local farmer in 1929 who found jade and stone artefacts. Excavations by archaeologists in the area yielded few significant finds until 1986 when two major sacrificial pits were found with spectacular bronze items as well as artefacts in jade, gold, earthenware, and stone. This and other discoveries in Sichuan contest the conventional historiography that the local culture and technology of Sichuan were undeveloped in comparison to the technologically and culturally "advanced" Yellow River valley of north-central China. The rulers of the expansionist state of Qin, based in present-day Gansu and Shaanxi, were the first strategists to realize that the area's military importance matched its commercial and agricultural significance. The Sichuan basin is surrounded by the Hengduan Mountains to the west, the Qin Mountains to the north, and Yungui Plateau to the south. Since the Yangtze flows through the basin and then through the perilous Three Gorges to eastern and southern China, Sichuan was a staging area for amphibious military forces and a haven for political refugees. In 221, during the partition following the fall of the Eastern Han - the era of the Three Kingdoms - Liu Bei founded the southwest kingdom of Shu Han (蜀汉; 221–263) in parts of Sichuan, Guizhou and Yunnan, with Chengdu as its capital. Shu-Han claimed to be the successor to the Han dynasty. Sichuan came under the firm control of a Chinese central government during the Sui dynasty, but it was during the subsequent Tang dynasty where Sichuan regained its previous political and cultural prominence for which it was known during the Han. Chengdu became nationally known as a supplier of armies and the home of Du Fu, who is sometimes called China's greatest poet. During the An Lushan Rebellion (755–763), Emperor Xuanzong of Tang fled from Chang'an to Sichuan which became his refuge. The region was torn by constant warfare and economic distress as it was besieged by the Tibetan Empire. During Song dynasty (960–1279), Sichuanese were able to protect themselves from Tibetan attacks with the help of central government. Sichuan also saw cultural revival like great poets Su Xun (蘇洵), Su Shi, and Su Zhe. Although paper currency was known in the Tang dynasty, in 1023 AD, the first true paper money in human history, termed jiaozi (交子, jiāozǐ), was issued in Chengdu. It was also during the Song dynasty did the bulk of the native Ba people of eastern Sichuan finally assimilated into the Han Chinese ethnicity. 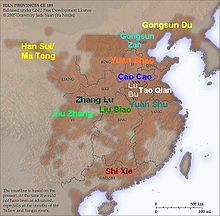 In the 12th and 13th centuries, the Southern Song dynasty established coordinated defenses against the Mongolian Yuan dynasty, in Sichuan and Xiangyang. The Southern Song state monopolized the Sichuan tea industry to pay for warhorses, but this state intervention eventually brought devastation to the local economy. The line of defense was finally broken through after the first use of firearms in history during the six-year Battle of Xiangyang, which ended in 1273. The Mongols was said to have sacked Chengdu in 1279 with over a million of its inhabitants claimed to have been killed. The recorded number of families in Sichuan dropped from the census taken in 1162 AD of 2,640,000 families, to 120,000 families in 1282 AD, as a result of forced population transfer to Mongolia, possible census inaccuracy and other war related causes. One such instance of deportation of Sichuanese civilians to Mongolia the almost immediate aftermath of winning a battle in 1259, more than 80,000 people were taken captive from one city in Sichuan and moved to Mongolia. The Ming dynasty defeated Ming Yuzhen's Xia polity which ruled Sichuan. In the middle of the 17th century, the peasant rebel leader Zhang Xianzhong (1606–1646) from Yan'an, Shanxi Province, nicknamed Yellow Tiger, led his peasant troop from north China to the south, and conquered Sichuan. Upon capturing it, he declared himself emperor of the Daxi dynasty (大西王朝). In response to the resistance from local elites, he massacred a large number of people in Sichuan. As a result of the massacre as well as years of turmoil during the Ming-Qing transition, the population of Sichuan fell sharply, requiring a massive resettlement of people from the neighboring Huguang Province (modern Hubei and Hunan) and other provinces during the Qing dynasty. During the Qing dynasty, Sichuan was merged with Shaanxi and Shanxi to create "Shenzhuan" during 1680-1731 and 1735-1748. The current borders of Sichuan (which then included Chongqing) were established in the early 18th century. In the aftermath of the Sino-Nepalese War on China's southwestern border, the Qing gave Sichuan's provincial government direct control over the minority-inhabited areas of Sichuan west of Kangding, which had previously been handled by an amban. In the 20th century, as Beijing, Shanghai, Nanjing, and Wuhan had all been occupied by the Japanese during the Second Sino-Japanese War, the capital of the Republic of China had been temporary relocated to Chongqing, then a major city in Sichuan. An enduring legacy of this move is that nearby inland provinces, such as Shaanxi, Gansu, and Guizhou, which previously never had modern Western-style universities, began to be developed in this regard. 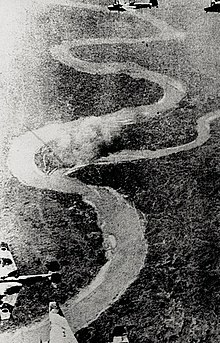 The difficulty of accessing the region overland from the eastern part of China and the foggy climate hindering the accuracy of Japanese bombing of the Sichuan Basin, made the region the stronghold of Chiang Kai-shek's Kuomintang government during 1938–45, and led to the Bombing of Chongqing. The Second Sino-Japanese War was soon followed by the resumed Chinese Civil War, and the cities of East China are obtained by the Communists one after another, the Kuomintang government again tried to make Sichuan its stronghold on the mainland, although it already saw some Communist activity since it was one area on the road of the Long March. Chiang Kai-shek himself flew to Chongqing from Taiwan in November 1949 to lead the defense. But the same month Chongqing switched to the Communists, followed by Chengdu on 10 December. The Kuomintang general Wang Sheng wanted to stay behind with his troops to continue anticommunist guerilla war in Sichuan, but was recalled to Taiwan. Many of his soldiers made their way there as well, via Burma. The province was deeply affected by the Great Chinese Famine of 1959–1961, during which period some 9.4 million people (13.07% of the population at the time) died. In 1978, when Deng Xiaoping took power, Sichuan was one of the first provinces to experiment with market economic enterprise. The twenty Prefecture of Sichuan are subdivided into 183 county-level divisions (53 districts, 17 county-level cities, 109 counties, and 4 autonomous counties). At the end of year 2017, the total population is 83.02 million. ^ a b New districts established after census: Shuangliu (Shuangliu County), Pidu (Pixian County). These new districts not included in the urban area & district area count of the pre-expanded city. 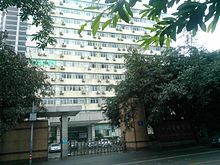 ^ a b c Jianyang CLC was transferred from Ziyang PLC to Chengdu PLC's jurisdiction after census; the City proper count is reflected onto Chengdu PLC not Ziyang PLC. ^ a b New district established after census: Anxian County). The new district not included in the urban area & district area count of the pre-expanded city. ^ a b New districts established after census: Nanxi (Nanxi County), Xuzhou (Yibin County). These new districts not included in the urban area & district area count of the pre-expanded city. ^ a b New district established after census: Luojiang (Luojiang County). The new district not included in the urban area & district area count of the pre-expanded city. ^ a b New district established after census: Dachuan (Daxian County). The new district not included in the urban area & district area count of the pre-expanded city. ^ a b New district established after census: Pengshan (Pengshan County). The new district not included in the urban area & district area count of the pre-expanded city. ^ Longchang County is currently known as Longchang CLC after census. ^ a b New district established after census: Mingshan (Mingshan County). The new district not included in the urban area & district area count of the pre-expanded city. ^ Kangding County is currently known as Kangding CLC after census. ^ Barkam County is currently known as Barkam CLC after census. Sichuan consists of two geographically very distinct parts. The eastern part of the province is mostly within the fertile Sichuan basin (which is shared by Sichuan with Chongqing Municipality). The western Sichuan consists of the numerous mountain ranges forming the easternmost part of the Tibetan Plateau, which are known generically as Hengduan Mountains. One of these ranges, Daxue Mountains, contains the highest point of the province Gongga Shan, at 7,556 m (24,790 ft) above sea level. The mountains are formed by the collision of the Tibetan Plateau with the Yangtze Plate. Faults here include the Longmenshan Fault which ruptured during the 2008 Sichuan earthquake. Other mountain ranges surround the Sichuan Basin from north, east, and south. Among them are the Daba Mountains, in the province's northeast. The Yangtze River and its tributaries flows through the mountains of western Sichuan and the Sichuan Basin; thus, the province is upstream of the great cities that stand along the Yangtze River further to the east, such as Chongqing, Wuhan, Nanjing and Shanghai. One of the major tributaries of the Yangtze within the province is the Min River of central Sichuan, which joins the Yangtze at Yibin. Sichuan's 4 main rivers, as Sichuan means literally, are Jialing Jiang, Tuo Jiang, Yalong Jiang, and Jinsha Jiang. Due to great differences in terrain, the climate of the province is highly variable. In general it has strong monsoonal influences, with rainfall heavily concentrated in the summer. 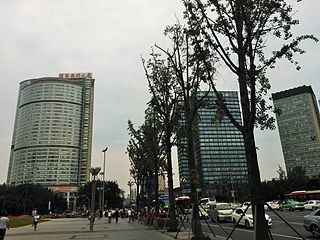 Under the Köppen climate classification, the Sichuan Basin (including Chengdu) in the eastern half of the province experiences a humid subtropical climate (Köppen Cwa or Cfa), with long, hot, wet summers and short, mild to cool, dry and cloudy winters. Consequently, it has China's lowest sunshine totals. The western region has mountainous areas producing a cooler but sunnier climate. Having cool to very cold winters and mild summers, temperatures generally decrease with greater elevation. However, due to high altitude and its inland location, many areas such as Garze County and Zoige County in Sichuan exhibit a subarctic climate (Köppen Dwc)- featuring extremely cold winters down to −30 °C and even cold summer nights. The region is geologically active with landslides and earthquakes. Average elevation ranges from 2,000 to 3,500 meters; average temperatures range from 0 to 15 °C. The southern part of the province, including Panzhihua and Xichang, has a sunny climate with short, very mild winters and very warm to hot summers. 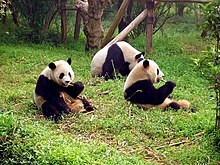 Giant Pandas live in bamboo forests, and low mountainous areas such as the Minshan Mountains in Sichuan. The majority of the panda population lives in Sichuan, with their range spreading into Shaanxi and Gansu. As it is abundant where they live, pandas diet consists of 99% Bamboo, with small other plants, or small animals consisting of the other 1%. Since the panda is native to China, it is the national symbol of China. 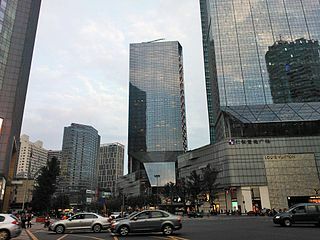 Sichuan is one of the major industrial centers of China. In addition to heavy industries such as coal, energy, iron and steel, the province has also established a light industrial sector comprising building materials, wood processing, food and silk processing. Chengdu and Mianyang are the production centers for textiles and electronics products. Deyang, Panzhihua, and Yibin are the production centers for machinery, metallurgical industries, and wine, respectively. Sichuan's wine production accounted for 21.9% of the country's total production in 2000. Sichuan's landscapes and rich historical relics have also made the province a center for tourism. 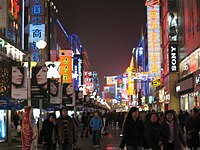 Sichuan has one of the largest economy in western China. Its nominal GDP for 2017 was 3.69 trillion yuan (US$547.71 billion), equivalent to 44,651 RMB (US$6,613) per capita. In 2008, the per capita net income of rural residents was 4,121 yuan (US$593), up 16.2% from 2007. The per capita disposable income of the urbanites averaged 12,633 yuan (US$1,819), up 13.8% from 2007. Chengdu Shuangliu International Airport is the 4th-busiest airport in mainland China. It was among the world's top 30 busiest airports in 2015, and the busiest in western and central China. It was also the fifth-busiest airport in terms of cargo traffic in China for 2013. Chengdu airport is the hub of Sichuan Airlines, Chengdu Airlines, Shenzhen Airlines, Tibet Airlines, China Southern Airlines, China Eastern Airlines, Lucky Air and Air China. Besides, Chengdu Tianfu International Airport is still under construction. Chengdu airports are also 144-hour transit visa-free airports for foreigners from many countries like Albania, Argentina, Australia, Austria, Belgium, Bosnia and Herzegovina, Brazil, Brunei, Bulgaria, Canada, Chile, Croatia, Cyprus, the Czech Republic, Denmark, Estonia, Finland, France, Germany, Greece, Hungary, Iceland, Ireland, Italy, Japan, Latvia, Lithuania, Luxembourg, Macedonia, Malta, Mexico, Republic of Montenegro, the Netherlands, New Zealand, Poland, Portugal, Qatar, Romania, Russia, Serbia, Singapore, Slovakia, Slovenia, South Korea, Spain, Sweden, Switzerland, Ukraine, United Arab Emirates, United Kingdom and United States. Chongqing was part of Sichuan Province until 1939 and 1954 to 1997. Xikang Province dissolved in 1955 and parts were incorporated into Sichuan Province. The majority of the province's population is Han Chinese (95% of provincial population), who are found scattered throughout the region with the exception of the far western areas. 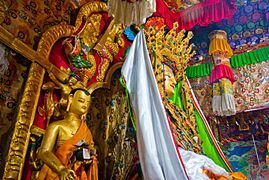 Thus, significant minorities of Tibetan, Yi, Qiang and Nakhi people reside in the western portion that are impacted by inclement weather and natural disasters, environmentally fragile, and impoverished. Sichuan's capital of Chengdu is home to a large community of Tibetans, with 30,000 permanent Tibetan residents and up to 200,000 Tibetan floating population. The Eastern Lipo, included with either the Yi or the Lisu people, as well as the A-Hmao, also are among the ethnic groups of the provinces. 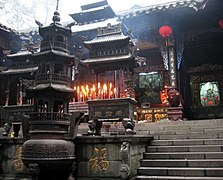 The predominant religions in Sichuan are Chinese folk religions, Taoist traditions and Chinese Buddhism. According to surveys conducted in 2007 and 2009, 10.6% of the population believes and is involved in cults of ancestors, while 0.68% of the population identifies as Christian. 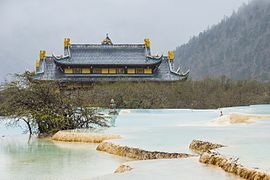 According to the Japanese publication Tokyo Sentaku in 1999 there were 2 million members of Yiguandao (Tiandao) in Sichuan, equal to 2.4% of the province's population. The reports didn't give figures for other types of religion; the vast majority of the population may be either irreligious or involved in worship of nature deities, Buddhism, Confucianism, Taoism, folk religious sects, and small minorities of Muslims. Tibetan Buddhism is widespread, especially in areas inhabited by ethnic Tibetans. Sichuan is one of the cradles of the early Heavenly Masters' Taoist religious movements. The Sichuanese people (Sichuanese: 巴蜀人 Ba1su2ren2; IPA: [pa˥su˨˩zən˨˩]; alternatively 川人, 川渝人, 四川人 or 巴蜀民系) are a subgroup of Han Chinese living in mostly Sichuan province and Chongqing municipality of China. Beginning from the 9th century BC, Shu (on the Chengdu Plain) and Ba (which had its first capital at Enshi City in Hubei and controlled part of the Han Valley) emerged as cultural and administrative centers where two rival kingdoms were established. Although eventually the Qin dynasty destroyed the kingdoms of Shu and Ba, the Qin government accelerated the technological and agricultural advancements of Sichuan making it comparable to that of the Yellow River Valley. The now-extinct Ba-Shu language was derived from Qin-era settlers and represents the earliest documented division from what is now called Middle Chinese. During the Yuan and Ming dynasties, the population of the area was reduced through wars and the bubonic plague and settlers arrived from the area of modern Hubei, replacing the earlier common Chinese with a new standard. The Li Bai Memorial, located in Jiangyou, is a museum in memory of Li Bai, a Chinese poet of Tang China (618–907) built at the place where he grew up. Building was begun in 1962 on the occasion of 1200th anniversary of his death, completed in 1981 and opened to the public in October 1982. The memorial is built in the style of the classic Tang garden. The Sichuanese once spoke their own variety of Spoken Chinese called Ba-Shu Chinese, or Old Sichuanese, before it became extinct during the Ming dynasty. Now most of them speak Sichuanese Mandarin. The Minjiang dialects are thought by some linguists[who?] to be a bona fide descendant of Old Sichuanese, but there is no conclusive evidence whether Minjiang dialects are derived from Old Sichuanese or Southwestern Mandarin. The languages of Sichuan are primarily members of three subfamilies of the Sino-Tibetan languages. The most widely used variety of Chinese spoken in Sichuan is Sichuanese Mandarin, which is the lingua franca in Sichuan, Chongqing and parts of Tibet Autonomous Region. Although Sichuanese is generally classified as a dialect of Mandarin Chinese, it is highly divergent in phonology, vocabulary, and even grammar from Standard Chinese. The Minjiang dialect is especially difficult for speakers of other Mandarin dialects to understand. Garzê Tibetan Autonomous Prefecture and Ngawa Tibetan and Qiang Autonomous Prefecture in western Sichuan are populated by Tibetans and Qiang people. Tibetans speak the Khams and Amdo Tibetan, which are Tibetic languages, as well as various Qiangic languages. The Qiang speak Qiangic languages and often Tibetic languages as well. The Yi people of Liangshan Yi Autonomous Prefecture in southern Sichuan speak the Nuosu language, which is one of the Lolo-Burmese languages; Yi is written using the Yi script, a syllabary standardized in 1974. The Southwest University for Nationalities has one of China's most prominent Tibetology departments, and the Southwest Minorities Publishing House prints literature in minority languages. In the minority-inhabited regions of Sichuan, there is bilingual signage and public school instruction in non-Mandarin minority languages. Sichuan is well known for its spicy cuisine and use of Sichuan peppers due to its more humid climate. The Sichuanese are proud of their cuisine, known as one of the Four Great Traditions of Chinese cuisine. The cuisine here is of "one dish, one shape, hundreds of dishes, hundreds of tastes", as the saying goes, to describe its acclaimed diversity. The most prominent traits of Sichuanese cuisine are described by four words: spicy, hot, fresh and fragrant. Sichuan cuisine is popular in the whole nation of China, so are Sichuan chefs. Two well-known Sichuan chefs are Chen Kenmin and his son Chen Kenichi, who was Iron Chef Chinese on the Japanese television series "Iron Chef". Another famous Sichuan cuisine is hotpot. Hot pot is a Chinese soup containing a variety of East Asian foodstuffs and ingredients, prepared with a simmering pot of soup stock at the dining table. While the hot pot is kept simmering, ingredients are placed into the pot and are cooked at the table. Typical hot pot dishes include thinly sliced meat, leaf vegetables, mushrooms, wontons, egg dumplings, tofu, and seafood. The cooked food is usually eaten with a dipping sauce. ^ Si (四) means "four", Chuan (川) means "plain", and Xia ("峡") could be understood as "gorge". Sì Chuānlù and Chuānxiá Sìlù are general names for the Four Circuits. ^ Some of the data collected by the Chinese General Social Survey (CGSS) of 2009 and by the Chinese Spiritual Life Survey (CSLS) of 2007 have been reported and assembled by Xiuhua Wang (2015) in order to confront the proportion of people identifying with two similar social structures: ① Christian churches, and ② the traditional Chinese religion of the lineage (i. e. people believing and worshipping ancestral deities often organised into lineage "churches" and ancestral shrines). Data for other religions with a significant presence in China (deity cults, Buddhism, Taoism, folk religious sects, Islam, et. al.) were not reported by Wang and come from different sources. ^ Based on a 2006 survey of the distribution of Buddhist institutions in China, assuming that the percentage of institutions per capita is consistent with the percentage of Buddhists (which has been proved so by data on other regions), the Buddhist religion would account for between 10% and 20% (≈15%) of the population of Sichuan. ^ As of 2010 there are 11,200 Muslims in Sichuan. ^ 《2015中国人类发展报告》 (PDF) (in Chinese). United Nations Development Programme China. 2015. Retrieved 14 May 2014. ^ 谭其骧; 王天良; 邹逸麟; 郑宝恒; 胡菊兴 (1980). "我国省区名称的来源" [Etymology of our country's provinces]. 《复旦学报(社会科学版)》 (S1): 128. ^ 张学君; 四川省地方志编纂委员会 (2003). 《四川省志·卷首》 [Annals of Sichuan Province, Volume 1]. 北京: 方志出版社. p. 103. ISBN 7-80122-933-9. ^ (in Chinese)Origin of the Names of China's Provinces, People's Daily Online. ^ 牛汝辰 (2016). 《中国地名掌故词典》 [Dictionary of Etymology of Chinese Places]. 北京: 中国社会出版社. p. 321. ISBN 978-7-5087-5238-9. ^ 贾文毓; 李引 (2005). 《中国地名辞源》 [Etymology of Chinese Places]. 北京: 华夏出版社. p. 360. ISBN 7-5080-3790-1. ^ Rowan K. Flad; Pochan Chen (2013). Ancient Central China: Centers and Peripheries Along the Yangzi River. Cambridge University Press. p. 71. ISBN 978-0521899000. ^ Historical Geographical Characteristics. General Office of Sichuan Provincial People's Government. ^ Anne P. Underhill, ed. (2013). "Chapter 7: The Sichuan Basin Neolithic - The Baodun Culture". A Companion to Chinese Archaeology. Wiley. ISBN 978-1-118-32578-0. ^ a b Steven F. Sage (2006). Ancient Sichuan and the Unification of China. State University of New York Press. pp. 2–3. ISBN 0-7914-1038-2. ^ Sanxingdui Museum; Wu Weixi; Zhu Yarong (2006). The Sanxingdui site: mystical mask on ancient Shu Kingdom. China Intercontinental Press. pp. 7–8. ISBN 7-5085-0852-1. ^ Chang Qu. 卷三 [Book 3]. 華陽國志 [Chronicles of Huayang]. pp. 90–91. ^ a b Terry F. Kleeman (1998). Ta Chʻeng, Great Perfection - Religion and Ethnicity in a Chinese Millennial Kingdom. University of Hawaii Press. pp. 17–19, 22. ISBN 0-8248-1800-8. ^ Sanxingdui Museum; Wu Weixi; Zhu Yarong (2006). The Sanxingdui site: mystical mask on ancient Shu Kingdom. China Intercontinental Press. pp. 5–6. ISBN 7-5085-0852-1. ^ a b Haw, Stephen G (2008). A Traveller's History of China. Interlink Books. p. 83. ^ a b c d Boland-Crewe, Tara; Lea, David (2004). The Territories of the People's Republic of China. Psychology Press. pp. 187–189. ^ Horesh Niv , 2012, "From Chengdu to Stockholm: A Comparative Study of the Emergence of Paper Money in East and West"
^ Roberts, John A.G. (2011). A History of China. Palgrave Essential Histories series. Palgrave Macmillan. p. 109. ISBN 978-0-230-34536-2. ^ Charles Horner. Rising China and Its Postmodern Fate: Memories of Empire in a New Global Context. University of Georgia Press. ISBN 978-0820338781. ^ State Power in China, 900-1325. p. 325. ^ Frederick W. Mote; Denis Twitchett (26 February 1988). The Cambridge History of China: Volume 7, The Ming Dynasty, 1368–1644. Cambridge University Press. pp. 125–127. ISBN 978-0-521-24332-2. ^ Guxi, Pan (2002). Chinese Architecture -- The Yuan and Ming Dynasties (English ed.). Yale University Press. pp. 245–246. ISBN 0-300-09559-7. ^ "Skeletons of massacre victims uncovered at construction site". Shanghai Star. 11 April 2002. Archived from the original on 22 April 2006. ^ James B. Parsons (1957). "The Culmination of a Chinese Peasant Rebellion: Chang Hsien-chung in Szechwan, 1644–46". The Journal of Asian Studies. 16 (3): 387–400. doi:10.2307/2941233. ^ a b Dai, Yingcong (2009). The Sichuan Frontier and Tibet: Imperial Strategy in the Early Qing. University of Washington Press. pp. 19–26, 145. ^ Yingcong Dai (2009). The Sichuan Frontier and Tibet: Imperial Strategy in the Early Qing. University of Washington Press. pp. 16–. ISBN 978-0-295-98952-5. ^ Cong, Xiaoping (2011). Teachers' Schools and the Making of the Modern Chinese Nation-State, 1897–1937. UBC Press. p. 203. ^ Marks, Thomas A., Counterrevolution in China: Wang Sheng and the Kuomintang, Frank Cass (London: 1998), ISBN 0-7146-4700-4. Partial view on Google Books. p. 116. ^ Cao, Shuji (曹树基) (2005). 大饑荒：1959－1961年的中国人口 [Great Famine: China's population from 1959 to 1961] (in Chinese). Hong Kong: 香港時代國際出版有限公司. ^ a b "Sichuan Province: Economic News and Statistics for Sichuan's Economy". Thechinaperspective.com. Retrieved 30 October 2011. ^ "Casualties of the Wenchuan Earthquake" (in Chinese). Sina.com. 8 June 2008. Retrieved 6 July 2008. , and "Wenchuan Earthquake has already caused 69,196 fatalities and 18,379 missing" (in Chinese). Sina.com. 6 July 2008. Retrieved 7 July 2008. ^ Lan Hong-xing (2012). "Study on Rural Poverty in Ecologically Fragile Areas-A Case Study of the Tibetan Areas in Sichuan Province" (PDF). Asian Agricultural Research. USA-China Science and Culture Media Corporation. 4 (1): 27–31, 61. Retrieved 26 March 2013. ^ , Panda Symbolism by Elena Harris. ^ "Chengdu Economic & Technological Development Zone". RightSite.asia. Retrieved 15 March 2011. ^ "Chengdu Export Processing Zone". RightSite.asia. Retrieved 15 March 2011. ^ "Chengdu Hi-Tech Industrial Development Zone". RightSite.asia. Retrieved 15 March 2011. ^ "Tibetans leave home to seek new opportunities". Xinhua. 14 March 2012. Retrieved 4 January 2014. ^ a b Tokyo Sentaku [in Japanese]. 1 June 1999. "Cult Groups Seen Shaking Party Leadership" (FBIS-CHI-1999-0614 1 June 1999/WNC). Cited in: ecoi.net, The Tian Dao (Yi Guan Dao, Yiguandao, Yi Guandao) sect and treatment of believers by the authorities. [CHN32887.E] [ID 171890]. ^ Catherine, ed. (26 May 2004). "Sichuan: Education and Culture". newsgd.com. Retrieved 4 January 2014. ^ Cui, Rongchang (崔荣昌) (1996). 第三章：四川的官话. 《四川方言与巴蜀文化》 (in Chinese). Sichuan University Press. ISBN 7-5614-1296-7. ^ Li, Bin (李彬); Tu, Minghua (涂鸣华) (2007). 《百年中国新闻人（上册）》 (in Chinese). Fujian People's Press. p. 563. ISBN 978-7-211-05482-4. ^ Wu, Dan (吴丹); Liang, Xiaoming (梁晓明) (23 November 2005). 四川交通："窗口"飞来普通话. 中国交通报 (in Chinese). ^ Zhang, Guosheng (张国盛); Yu, Yong (余勇) (1 June 2009). 大学生村官恶补四川方言 现在能用流利四川话和村民交流. Morning Post (in Chinese). ^ 走进大山的志愿者. 四川青年报 [Sichuan Youth Paper] (in Chinese). 18 July 2009. 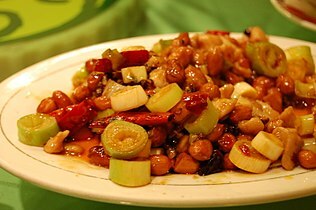 ^ Sichuanese Cuisine (in Chinese) - Pictures, descriptions, history, and examples of Sichuan cuisine. ^ Roberto A. Ferdman (3 July 2013). "The world's new largest building is four times the size of Vatican City". Quartz. Quartz. Retrieved 4 July 2013.